With everything from luxurious, bold necklaces to amazing bangle bracelets to lavish jeweled rings, Stella & Dot has it all. And not only is the jewelry beautiful (if you haven't checked them out, head over and see what they have to offer - but be prepared to fall in love with quite a few favorites) this company is different from the norm. Instead of just selling gorgeous pieces on their website, Stella & Dot helps today's modern woman find a balance between having a successful career and a busy family. By running their own home-based business, a mom can sell fashionable jewelry at trunk shows, online and more and have a great time doing it. Sound like something you might be interested in? Then be sure to find out about becoming a Stella & Dot Stylist. But wait, there's more. Stella & Dot recently launched a Little Girls Collection that is so cute and affordable that any future fashionista would definitely adore dressing up with these items. Created with the same high quality standards and attention to detail, the Stella & Dot Little Girls Collection features necklaces, bracelets, rings and accessories that are age-appropriate and rigorously tested to be safe for children. But all that boring stuff aside, they're also completely fun for any little girl! Big Sister E and I went through all of the catalog pages online and she oohed and aahed over pretty much each piece but we finally came to conclude with the Mini Soiree Necklace. When it arrived in its sweet and colorful keepsake tin, that in itself was a great gift. But the beauty of the outside didn't compare to what was waiting for us when we opened the tin to reveal the inside. This 13" strand of faux pearls features a sparkly pave ball that Big Sister E couldn't take her eyes off of and left me wondering if I could get away with borrowing it for myself. Each pearl is smooth and shiny and the stretch elastic has enough give that we didn't have to force the necklace on over my daughter's head. It really combines the right amount of style and cuteness without actually being cutesy or silly. As for Big Sister E, as much as she loves playing dress-up, she still refuses to wear skirts or dresses sometimes. The fact that she was overly eager to put on her "pretty dress" to see how well the Mini Soiree Necklace would finish the outfit demonstrates just how much she immediately loved it. I mean, c'mon, pearls! It just doesn't get much cuter. If there is a girl in your life that even remotely enjoys dressing up, she will love the Little Girls Collection from Stella & Dot. Their jewelry has charm, style and is sure to bring a dose of pure enchantment every time she puts it on. Whether heading to dinner in a "pretty dress," playing in the land of make-believe or for a fun birthday gift, the Little Girls Collection will captivate any lucky princess. One lucky person will win their item of choice from the Stella & Dot Little Girls Collection! ARV $29! To enter to win: Visit Stella & Dot's Little Girls Collection, browse the adorable jewelry and tell me which one is your favorite. 1 Extra Entry (per method) if you follow Felissa, Stella & Dot Stylist, on Twitter, join her Facebook group, follow her blog with Google Friend Connect and/or sign up to receive her blog emails for special promotions and updates (be sure to verify your subscription). 3 Extra Entries if you blog about this giveaway linking back to Thanks, Mail Carrier and Stella & Dot. Please leave an address where it can be found. 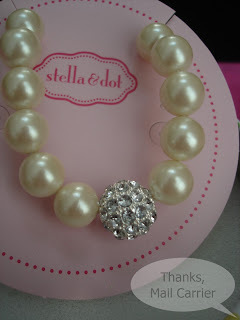 A big thank you to Felissa at Stella & Dot for providing a Mini Soiree Necklace for me to review as well as a jewelry item of choice for one lucky giveaway winner. The opinions shared are my own and honest and if you really need to see more, click here to see how I roll. I love the Mini Bloom Flower Ring! I entered your Votre Vu giveaway! I entered your Yoplait Greek Yogurt giveaway! I love the Little Dottie Necklace. So cute. Entered your Sophisticated Baby Gifts giveaway. I really like the Little Dottie Necklace. Ooooo. My granddaughter would like the Kristin Charm Necklace set. I'm an email subscriber #2. Big Sister E looks gorgeous and very happy in her pearl necklace. My daughter would love the Charm Necklace! Entered the EatSmart kitchen scale giveaway! I've entered your Princerss Couture Designs giveaway. I've entered your Sophisticated Baby Gifts giveaway. I've entered your CSN giveaway. Love the Mini Bloom Flower Necklace! 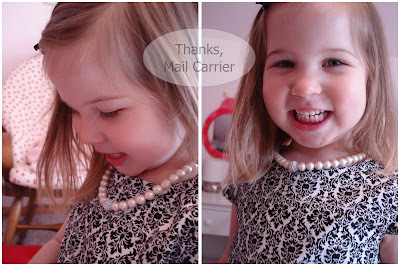 LOVE the Allie ribbon & pearl necklace! Love the Kristin Charm Necklace. I love the Kristin Pearl Bracelet for my daughter. 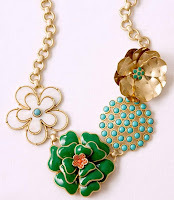 This is so tough, but I think my fave is the "Mini Bloom Flower Necklace"! I follow Felissa, Stella & Dot Stylist, on Twitter. I like the Kristin pearl bracelet. I love the little dottie necklace!